Everything you need to set up your pet reptile cage or terrarium! For many first time reptile owners, the hardest step is to figure out just how to set up a home for their new pet. Don’t worry, it is not that complicated if you know what you need. Most beginners just go out to their local pet store and get everything the staff recommends, which is quite unnecessary. Usually, you need a lot less than what you think you need! So, here we will discuss what you definitely need to set up a home for your reptile and how you can tell what is unnecessary! Where is the animal from? What habitat does your future pet reptile live in? What is the local temperature/humidity throughout the year in the wild? How old is it and how long will it live? Of course, you should know a lot more about your future pet, but these things matter the most when it comes to choosing your cage setup! Green Tree Pythons need a very specific climate – awalys do your research! Now, lets get started on how to set up your pet reptile habitat! The first thing you are going to have to get is a cage or terrarium for your reptile! I always advise beginners to set up naturalistic enclosures that have a lot of space for the animal to explore. Many people keep snakes in tubs or rack systems where the animals are cramped into small spaces all the time. Yes, ball pythons may not move a lot, but they occasionally will explore and roam around if given the space. So, make sure your pet has a reasonably sized cage compared to its body length. For snakes, 1 * 0.5 * 0.75 (length * depth * height) times the length of an adult animal is enough. In the end it is of course entirely up to you what size you choose. However, keep in mind that we always want to give our pet a habitat that is as close to the wild as possible. I am aware that under some circumstances, keeping reptiles in rack systems and tubs is necessary but it should be avoided whenever possible. Also, check if there are any laws that restrict the size of your terrarium. In Switzerland for example, each snake cage mus be at least 1 * 0.5 * 0.5 (length * depth * height) times the length of an adult animal. Keeping snakes in naturalistic enclosures brings many more pleasures to the hobby that just the animal itself. A beautifully designed terrarium can be a very nice addition to your living space! what the temperature is like throughout the year in its natural habitat. what type of lifestyle it lives. (arboreal, in burrows or on the ground? All these things will matter when you choose the heating methods and technical aspects of your cage. Some devices are better suited for each species than others. It is always good to get an opinion from someone who has already kept the species you want to get. They can tell you what has worked out for them and what you should avoid. Some animals may need specific beddings. This gaboon viper likes to hide in the leaves. Keep in mind that pet store owners do also not know everything about you species and may not even have any experience with it. Do not just buy a standard cage setup in any case, but choose what your reptile needs the most. When it comes to technical additions like heat lamps, heat pads or other devices to control humidity, there are a lot of options around. You need to do your research and figure out which one is best for your species. If you are uncertain what your options are, click HERE to find out more about methods to heat your terrarium. If you are more concerned about humidity, click HERE. Now the last and most obvious step is the final setup of your cage. After you have done all the research on your new pet, it is time to create a home for them. The best solutions is always a terrarium that is as close as possible to the natural habitat of your animal! With a naturalistic enclosure, it is very unlikely that you run into problems like stress or sickness along your journey. So, just go out into the woods, find some nice logs and rocks or buy artificial plants or decoration online. Now, if you are interested, HERE you will find a collection of terrarium plants for decoration! Artificial plants and flowers can set a beautiful tone! All that’s left your you to do is set up the cage and decorate its inside. Make sure that you set it up in a space that is easily accessible. In case of a technical problem, everything should be easy to reach and fix. So, don’t worry and go ahead and have fun setting up your first pet reptile cage. If you have done all your research and follow the instructions, it is not that big of a deal! Good luck! I know how hard it can be to find the right equipment and setup for a reptile home. They key is to do your research! I hope that this post was helpful and has encouraged you to go out and do it yourself! As always, feel free to leave a comment or contact me directly with you questions. People have always given names to things around them, including plants and animals to identify individuals in the huge world of biodiversity. Essentially, this is what the biological classification of organisms, or Taxonomy, is all about. It is a way for biologists to accurately name and identify one species next to another to better understand the works of ecosystems, evolution and divergence. This beautiful Naja siamensis, a spitting cobra, belongs to the Elapidae family. It all started in the 18th century when Carl Linnaeus published a system that would evolve into our system of taxonomic classification for biodiversity. Linnaeus not only gave things a name, but he was the first to develop a hierarchical classification system that held information about what the species was (its Latin name) and who it was closely related to. This would allow scientists to understand complex relations in ecosystems. We often see fancy Latin names next to the common names on the boards at the zoo that tell us a little about the animal we are looking at. Now, we want to make sure that the next time you see a name like this, you too can understand what is tells us about the animal it was given to! Bitis rhinoceros, Gaboon Viper – this animal is closely related to the Puff adder, Bitis arietans – in this post you will learn how you can tell by their taxonomic names! Especially in the reptile hobby, where many animals are often only called by their scientific name, understanding this system will give you a great advantage and fewer terms to look up if you ever read a scientific book or listen to scientists talking! Taxonomy is the practice of identifying and categorizing organisms in a hierarchical structure. Every organism, both living and extinct, is classified in a specific group along with other similar organisms and given a scientific name. This system has various taxonomic categories. These gradually shift from being very broad an including all kinds of organisms to being more specific until each species eventually has an individual name. The eight categories are in shrinking order: Domain, Kingdom, Phylum, Class, Order, Family, Genus, and Species. With each step down this ladder, organisms are split into more and more specific groups. For example, the Kingdom “Animalia” is split into many Phyla (plural of Phylum), one of which are the “Chordata” (vertebrates). The Chordata are then split into many Classes, one of which are the “Reptilia” (the reptiles). This means that all Reptilia belong to the Chordata, but the Chordata also include mammals and amphibians and so not everything in the Chordata is necessarily a reptile. This is similar with all the other categories – the closer we get to the species, the narrower the tree of relatives gets! The broadest category, the “Domain” splits all organisms into three groups. The three Domains of life are the Bacteria, Archaea and Eukaryota. For a long time, all organisms were classified into just a few Kingdoms like animals, plants, fungi, protists, bacteria and archaea. However, new genetic analysis of organisms and genetic inheritance models suggest that this division may have to be revised and split into further Kingdoms. Although a Phylum is still a very broad group, it splits Kingdoms into already very recognized smaller categories. For example, the Kingdom Animalia is split further into the vertebrates (Chordata) or all insects, spiders and crustaceans (Arthropoda). Invertebrates are split into many smaller Phyla. Classes are the next step closer to the species. Notable classes include the reptiles (Reptilia), mammals and amphibians from the Phylum of vertebrates (Chordata). Each Class is further separated into Orders. One example from the Reptilia Class are the Squamata. This is a large order of reptiles that collectively includes all scaled reptiles. Orders can be further separated into Sub-Orders. For example, the Serpentes are a Sub-Order of the Squamata and include all snakes. A Family is the next level down. Understanding the Families of reptiles can be very helpful to identify a species. One of the most known Family of snakes are the Vipers (Viperidae). Elapids (Elapidae) are also a very notable Family of venomous snakes. Just like Orders, Families can be further separated into Sub-Families. As an example, the Viperidae can be separated into Pit-Vipers (Crotalinae) and Old World Vipers (Viperinae). You can read more on these Families HERE. The second last step down the classification ladder is the Genus. Genera (plural of Genus) include only very closely related species. All members of a Genus usually have a lot in common and are sometimes only hard to tell apart. One notable genus of snakes are definitely the Rattlesnakes which belong to the Family of the Pit-Vipers (Crotalinae). The final taxonomic category is the Species. All members of a Species can produce fertile offspring. If this is not the case, the two animals were not from the same species. Each Species is assigned a latin name, often according to one special characteristic or the name of its discoverer. For example, if we look at the largest species of the Genus Crotalus, we realize that it got its Species name (adamanteus = made of diamonds, of adamant) because of the diamond shaped markings on its back! This is of course the well-known Western Diamondback Rattlesnake or Crotalus adamanteus. Now, after we have slowly and step by step classified the organism, we have to set its Latin name. This is actually quite simple – as you might have guessed from above, the taxonomic name of an organism is just the name of its Genus and Species put together. So, if we know that the Western Diamondback Rattlesnake is part of the Genus Crotalus and we know that its Species name is adamanteus, then we simply put the two together to get the full taxonomic name: Crotalus adamanteus! Now you can always understand what the two Latin words on the small boards next to the animals at the Zoo represent and how you can use them to understand how some animals are related! I hope you have learned something new about Taxonomy today and feel a bit more comfortable with the way organisms are classified in biology! When it comes to heating an enclosure, heat lamps are the most popular choice among reptile keepers. They are easy to set up and create a nice hot-spot for your reptile. They are certainly among the most efficient heat sources you can choose for your terrarium. Yet, many keepers encounter a number of problems when dealing with heat lamps. In this post I want to address issues like overheating, dried out air and skin burns on the animal or the keeper himself and how you can avoid them. 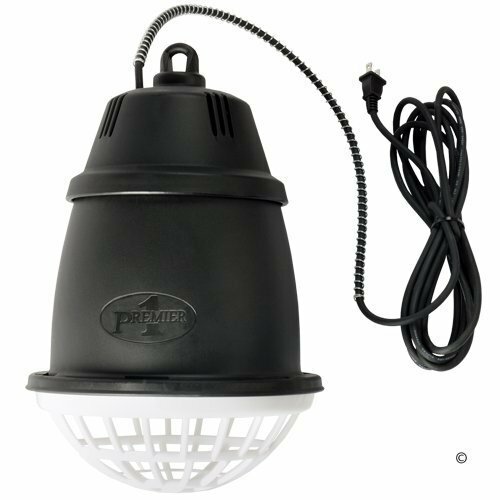 Certainly, the most common issue reptile keepers have with their lamps is overheating. You can recognize this issue quite easily – either you realize that the thermometer in your enclosure show a higher than appropriate temperature or you tried touching the lamp and it was very painful. Either way, this is a very common issue and it can be dangerous for your animal depending on how the lamp is set up. Now, why does almost every heat lamp overheat eventually? Skin burns on your pet reptile are not very pretty and should be avoided! Actually, it is not even the lamp that is overheating but most likely the metal case around it. Unless you chose the wrong intensity on your lamp, it should not get too hot. However, the longer you leave it switched on, the hotter its metal case is going to get and eventually, the case is going to radiate out even more heat along with the lamp. Now, another reason why your heat lamp is getting so hot could very well be that you have underestimated its power when buying it and got a too strong lamp for your enclosure. This is very common with beginners and you will learn to guess the heat lamp intensity you need for your enclosure eventually. However, if you do not want to buy another lamp or constantly switch the lamp on and off to avoid the metal getting to hot, there is a much simpler solution to your problem – a thermostat! If you do not know what a thermostat is, click HERE for a simple tutorial on how to use and set up this lifesaving device. As mentioned before, skin burns and other injuries from the heat lamp could be the result of overheating and burning hot metal cases of the lamp. Reptiles are often very curious and do not hesitate to climb around in their enclosures, even occasionally on their heat source. In most cases, the thermostat will also solve the problem and protect your reptiles from injuries. However, sometimes, the lamp is still getting too hot and posing a threat to your reptiles health. In that scenario, only a protective basket above the heat lamp will do the trick and fully guarantee that your animal is not getting dangerously close to its heat source! Such a basket is very easy to install and can be acquired at your local pet store! You can also buy heat lamps that have protective caps installed already, like seen in the images. You can click HERE to check them out on amazon.com. This is probably the most common problem with heat lamps and it is a very annoying one. Heat lamps distribute heat waves that have a tendency to dry the air around the lamp, which is especially problematic if you keep reptiles from more humid regions like South-east Asia or Central Afrika. Unfortunately, there is really not much you can do about this, except for manually raising the humidity in the enclosure. You can also try to mist the surroundings of the lamp directly to counteract this annoying effect by cooling the surface of the lamp. However, if this issue gets too extreme, there are always other great options to heat your terrarium that do not have this issue. Most snakes and reptiles live in rather moist and humid areas of the world. Very often, reptile keepers experience difficulty and issues when it comes to keeping the optimum humidity levels inside your cage. It is very important that you keep the humidity levels your pet would also experience in the wild to avoid shedding and dehydration. Humidity control is and essential point when it comes to keeping your animals skin and tissues healthy. Most reptiles come from exotic locations that may be very different in terms of temperature and humidity percentage in the air. For many keepers, the reality is that those circumstances are not given in their home country, which is why we need to heat and mist our animals cage constantly to give it the surrounding it is used to in the wild. In this article, I want to introduce you to my favourite techniques and methods when it comes to keeping that optimum air humidity percentage. First of all, I want to tell you that humidity control is not as difficult as its is sometimes said to be on forums and other platforms. In fact, most reptiles that are common in the pet trade are not incredibly sensible to dehydration. That is not to say that you should keep an eye on the appropriate humidity, but you usually should worry if your cage is a bit dry once in a while. Many snakes or lizards do not need such a high humidity percentage all the time and they are usually fine on a bit dried out soil as well. The crucial period comes when the animal is starting to get into shed and replace its old skin. During those days, it is important that you keep the humidity on an appropriate level to ensure the clean replacement of the skin and to avoid any stuck shed. Stuck sheds can lead to dangerous constrictions and necroses in the skin, so you must make sure that the animal has the necessary conditions to shed. Misting refers to using an aerosol or something similar to spray down the inside of your cage. This will temporarily simulate a rainfall and leave the cage in a wet condition. Over the next couple of hours, the cage will start to dry off and the humidity percentage inside will rise, depending on how much you sprayed. One it has completely dried off, it is time to spray again. These Spray bottler are perfect for misting your cage once a week. However, for most reptiles common in the pet trade, this does not have to be done on a daily basis. It is perfectly fine to spray down your cage only once a week if you are keeping a reptile that does not come from tropical areas of the world. That way, it will experience rising humidity levels similar to rainfalls without living in a wet cage all the time. It is also a useful extra once your animal gets into shed. You should spray it directly a couple of times to let the skin soak up the water and ensure a clean shed. Otherwise, you do not need to mist regularly, unless your animal is showing signs of dehydration or your country is experiencing an unusual drought. You can get yourself just the same spray bottles I use HERE from amazon.com as a useful extra for your reptile husbandry! Although it is not the most ecological method out there, humidifiers are an incredibly useful tool if you are keeping Green Tree Pythons or other snakes and reptiles that live in very tropical and humid areas around the world. It is sometimes very difficult to keep up the misting if you are keeping multiple animals or are on a busy schedule. Humidifiers will take care of the air inside your cage. However most of us can’t just place one inside the terrarium, which is why I highly recommend using a hose to connect your cage to the humidifier. On most humidifiers, you can set the time and amount of water you want to vaporize into your room. You must first test out how long your model has to run to create the perfect setting inside your cage before you place the animal inside, but after that, you don’t need to take care of it anymore. You can click HERE to see the humidifier I use to keep my cages moist or go to amazon.com to find your favourite model! Sprinklers can also be a very useful method if you are keeping reptiles that require high humidity levels and are used to periodic rainfall and tropical climates. However, such devices are often difficult to install and are only really worth the while in large enclosures or outdoor cages. If you have the skill and equipment however, they are perfect for your tropical pets and will be highly attractive. They are also great for simulating periodic rainfalls. If you can program them to activate at a given time they will keep your cage moisture stable and your animal very happy. Sprinklers are the perfect and aesthetic solution if you want to simulate periodic rainfall or tropical conditions for your pet! If you are interested in finding the right model for your cage, go to amazon.com to see the available models! I sincerely hope that you found this article very helpful and that you can now choose the right method for your reptile. If you have any further questions, let me know by email. When it comes to keeping Green Tree Pythons (GTP), probably the most important task is to keep the housing stress free and the humidity high. GTPs are very sensible to stress and low levels of humidity since they come from very remote locations on the tropical islands of Papua New Guinea. Here, tropical rainfalls are a common thing and in the vast jungles, the humidity rarely drops below 60°. Also, this small species of pythons usually inhabits the high canopies in dense rain forests. Here, they have almost no natural predators and are rarely subject to stress. This is why keeping the animal calm is so important. In this article, I am going to show you different methods and housing strategies that you can apply and choose from. An important aspect of proper housing is the stress free environment for your animal. It should include features that enable your python to life by its natural habits. This way, your python does not have to adapt. Practical refers to the space in your home and the space the python needs to move freely. It seems to be a common opinion that a 60 * 60 * 60 cm (length * depth * height) cage is an appropriate size for almost any snake. Contrary to popular beliefs, a GTP does not require an exceptionally high cage. It is just as appropriate to have a wide and rectangular cage! The python does not care how far it is off the ground, but only how much climbing opportunity and space it has in total. Also, as always I suggest that you do not get a cage you cannot afford. This just means that you should not try to get a huge terrarium only to find out that you cannot manage the temperature inside. This is especially true if the pythons need differs largely from your home climate. Make sure that you can support the pythons livestyle on your budget. Snakes are sometimes even more relaxed in confined and personal spaces where they feel safe. You should be more worried about the climate than the space! In Nature, there is not always a constant temperature around. Just like us, Green Tree Pythons sometimes feel the need to cool down or warm up. To enable the animal to choose its own temperature, we must ensure that there is a temperature gradient inside the cage. This just means that there should be a heat spot where the animal can warm up on one side, and a cooler region on the other side of the cage. This will create a gradient between the two ends where the animal can choose its own resting spot. If you want to read more on Temperature gradients and heating methods, click HERE. We achieve this heat gradient by placing the heat source on one end of the cage and not in the middle. The heat source should be either in the form of a heat panel that sticks to the ceiling or an infrared light. For more information on heat sources, visit the page “The Best Methods to Heat your Terrarium” for detailed reviews to find the right heat source for yourself! When it comes to GTP cages, it is very important that we have a natural set up that enables our pythons to climb, hide and rest on branches, just like the would in the wild. First of all, the set up should include a variety of thick and thin branches arranged both horizontally and vertically to make sure that our python can climb and find nice resting spots. It is advisable to use natural sticks and branches that are not completely smooth. This gives the python a natural impression and make shedding easier. Some pythons may experience difficulty shedding if they do not have the rough natural bark to rub against. You can just get some branches from your local forest, dry and wash them, and decorate your terrarium with them. Usually, you not have to worry about parasites if you choose nice and clean branches or sticks! You should include natural ranches, and some plant to enable you animal to climb, hide and rest! Second, your setup should definitely include a variety of either artificial or natural plants as cover for your animal. Most pythons do not like to be exposed during the day. They prefer to be lightly covered behind a bush or some artificial leaves. This is important to ensure that your animal is not stressed out by any people walking by its cage. Since Green Tree Pythons are arboreal, they do not necessarily need a hiding place on the ground. Also, always have a bowl of fresh water in your cage just in case. Most green tree pythons however drink directly from the droplets of water that condense on their skin. Fortunately, there won’t be very much to do here. I recommend spot cleaning your cage quickly every day. This basically just means checking for snake waste or skin and removing it quickly. That way, you only have to replace the entire bedding and clean the entire cage once every six or seven months. Make sure that there is always a bowl filled with fresh water and that the sphagnum-moss or substrate is always appropriately moist. The humidity level is is probably the most crucial aspect, especially for beginners. Since this species of pythons comes from tropical islands, they are used to the moist environment. Consequently, they require a constantly high level of moisture around them to keep the skin healthy. We should ensure that the humidity throughout the day ranges between 65% and 100% and that it changes only slightly over the course of the day. This will greatly improve your animals health and help it avoid shedding issues. Also, a dried out individual will automatically more stressed out and nervous. Since GTPs are very sensible, we must make sure that we do the best we can. If the widows have fogged up like this, you have reached a perfect level of humidity and can let them dry off now. However, it is not important to keep track of the exact humidity value and start freaking out all the time when it drops slightly. Instead, we want to simulate the natural conditions from the wild. Usually, there are heavy rainfalls in the morning and evening and drier period during the day. At night, due to lower temperatures, the humidity will rise again. We can simulate this type daily structure by raising the humidity in the morning and again towards the night. During the day, the cage gets a chance to dry off slightly. A great clue are the windows; after your morning mist, they should be completely fogged up and hardly transparent. Until lunchtime, they should dry off and become transparent again. Lastly, in the evening, you should mist again, but only about half the amount from the morning. Of course, everybodies local climate is different so you need to try out which works best for you. There are several great methods to control the humidity inside your cage. These include, but are by far not limited to, spraying by hand, automatic sprayers and humidifiers. Before you choose, you should be aware of your environment. Things like air conditioners can dry out a room fairly quickly while natural plants help stabilizing a moist surrounding. All of these methods have both advantages and disadvantages. To see the full description and choose which one is best for you, click HERE! I hope you found this post helpful and enjoyed reading about the care for Morelia Viridis! For more information on this topic, let me know by email what posts you would like to see. For questions on my sources, visit “My Sources”. The main source for this post was “Morelia Viridis – Das Kompendium” by Greg Maxwell. This book is definitely the #1 guide to keeping GTPs healthy. If you want to have a look, click HERE. As always, feel free to leave a comment or contact me directly via email with your questions!